Last weekend, my family gathered for our annual sojourn to the woods of Southern Ohio, where we hang out and eat a lot, sometimes hike and sometimes swim and sometimes play tennis and always laugh. And thus, a terrible idea was born. The really crazy thing is not that someone thought of this, joked about it and even put the marshmallows and hot dogs on one stick for roasting and toasting. Many people (your humble narrator NOT included) opted to chow down on these creations. (And raved about the results!) I have a checkered past with chili dogs, and the idea of adding chocolate, marshmallow and graham cracker didn’t seem like it would help. But if you are feeling brave next time you have a bonfire roaring in front of you… Go forth, I say. Try a s’more dog. and that “someone” who thought it would be a good idea was your sister. 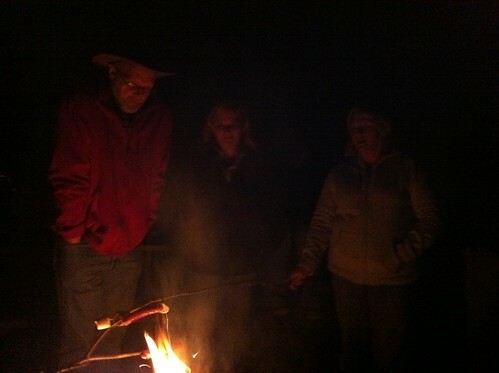 And those renegades who tried the first s’more dogs were your sister and your cousin. And it was GOOD. It was a chewy, meaty, sweet, hot, crunchy, chocolate sensation….that’s all I’m sayin’!